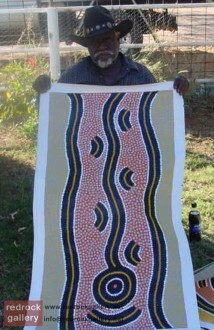 Long Jack Phillipus Tjakamarra is one of the founding members of the Papunya Tula Artists and his exquisite artworks pay homage and acts as instruments to preserve his culture ancestral traditions. Born in his mother’s country ‘Kalipinya’ [an important Rain Dreaming site] he grew up in the bush west of Pilininyanu until his teenage years when his family settled in Haasts Bluff. Here he remained, working as a labourer and stockman until in 1959 when Papunya was established and he moved location to work as a councillor and school yardman. He along with Billy Stockman Tjapaltjarri, Kaapa Tjampitjinpa, were selected by fellow male Papunya peers to paint the instrumental ‘Honey Ant Dreaming’ mural on the school wall. Although being a good Christian [1984: ordained Lutheran pastor], a family man with five children, his skills regarding hunting and tribal knowledge are unsurpassable. Thus, he is considered to one of Australia’s most knowledgably and leading Aboriginal Artists and his artworks unique locate tradition within the contemporary. Aboriginal culture locates ‘Dreamtime’ as the beginning of all knowledge, from which came the laws of existence. All activities and ways of life- ritual, ceremony and duty relate to this ‘Dreamtime’. Knowledge concerning this beginning of time is sacred and passed down from one generation to the next via ceremony, stories, dance and imagery. Everything in the natural world is a symbolic footprint of the metaphysical beings whose actions created the world. As with a seed, the potency of an earthly location is wedded to the memory of its origin. After full tribal initiation, all men and some woman own a ‘dreaming’ and are thus charged with its custodial responsibilities to preserve and pass on this sacred knowledge. It is believed that in the beginning Dreaming, three beautiful young woman came down upon the earth and went walk-about. As they ventured, from time to time they had to stop and pass water; where they did so, they left the sacred waterholes. If the mortal man drinks from these sacred waterholes, the liquid ingested would greatly enhance their ability to learn the Dreaming knowledge.